Kristina Killgrove links to an article on Schliemann's Mycenaean mummy. The mummy hasn't actually been unknown, and I had seen a picture of it (presumably Schliemann's engraving?) in Louise Schofield's the Mycenaeans (2007) where it was said to be under study. 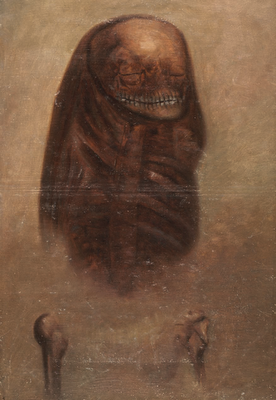 But, the new article does include a very good reproduction of the painting that looks a little Giger-esque to me. Perhaps there's room here for some National Geographic-style documentary; after all, mummies seem to be quite popular, and this ought to be a very interesting one, assuming 19th century attempts at preservation stood the test of time, and there's something to show. Plate 203 is not a photograph but an oil-painting (Fig. 6). This is the painting made of the supposed ‘mummy’ burial in Shaft Grave I (now V) which formed the basis for the published engraving (Schliemann 1878, 297 no. 454). It is on stiff card, measuring some 585 mm in length and 382 mm in width, and shows the corpse about three-quarters life size in sombre shades of brown against a lighter yellowish brown background. The engraving omits the lower part of it in which the region of the pelvis and the tops of the femurs are visible. The painting had been folded in half to fit it into the Album, but I had it removed and framed behind glass for its better conservation. I'm no biochemist, but alcohol and gumsandarac doesn't sound good with respect to any potential DNA preservation.